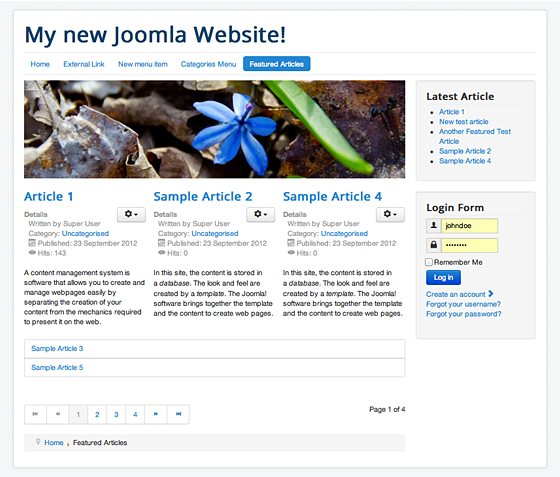 Joomla allows you to create pages with a lot of content based on similar attributes. 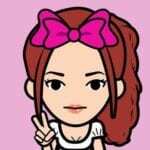 Today I will guide you to search for a number of available options. First you mark some of the reports in the page as Featured. 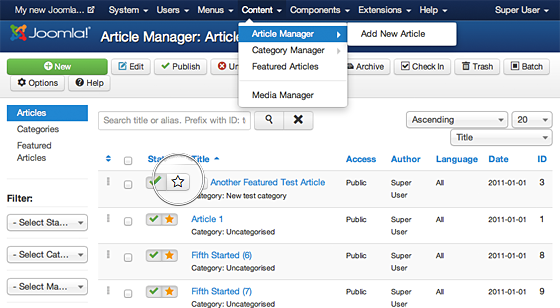 To do so go to Content -> Articles Manager and mark the article as Highlight is pressing the star next to it. It will turn yellow. If you want to choose your own articles then do this. You create a new menu item Menus -> Main Menu -> Add New Menu Item. A popup with the available menu types will appear. Expand the Articles section and select the Featured Articles option. 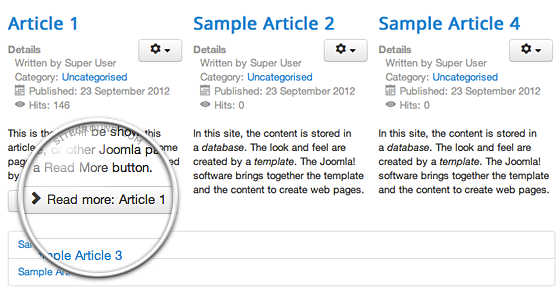 Joomla will display the full text of the expanded report at the top of the page. If you have many featured articles, it will be listed as links at the bottom of the page and the pagination is automatically generated to lead to the next page full text article. You can specify any number of posts you want. You can choose how many posts to display on this page. You can also choose how many columns to display for the referral and how many featured articles are listed at the bottom of the page. To do this go to Menus -> Menu Menu and select your menu item. 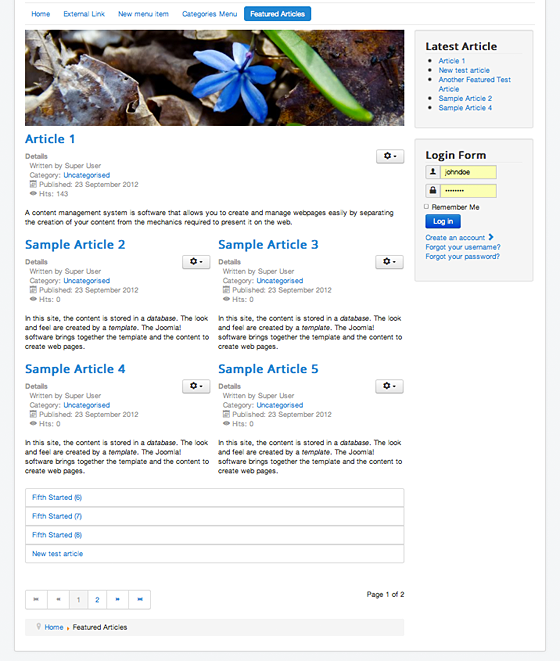 Click the Layout tab and configure your home page interface. 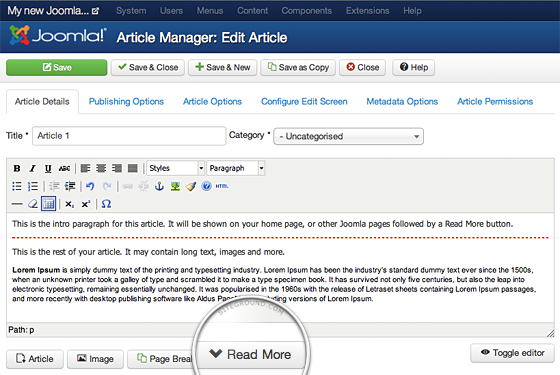 Joomla will display the full text of each featured article on the page. However, you can select the number of each featured report displayed by using the Read More feature in your article manager. To do so, open the article in the article editor, click on the article you want to split, and click the Read More button directly below the editor. The red dot is displayed, separating the introduction from the rest. .